I used to swear by Winamp for playing my MP3s. For years and years I thought people were crazy for not using Winamp, then something happened with Winamp's development that had me looking for an alternative player. I flirted with the Quintessential Player for a while, and eventually ended up with iTunes. 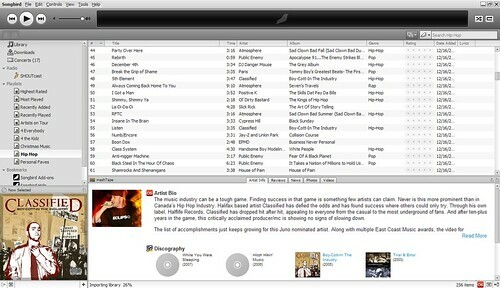 Songbird is an open-source media player built on the same platform as my beloved Firefox. I've actually tried it twice before, when it was a proof of concept and Songbird 0.2. Now that they've released Songbird 1.0.0, I had to give it a third try. It's so much better now. It's fast, stable and far more fun than iTunes. Like Firefox, there are add-ons that enhance the experience. For example, there is an add-on called mashTape that gives me band info, a discography, videos and more for each artists I play. I also use the side panel for song lyrics, and another add-on that tells me when an artist in my collection is coming to Toronto. This is the open source iTunes killer I've been waiting for. It's finally ready for prime time. I'd still swear by Winamp as an all-in-one if it wasn't for it's inability to play nice with anything HD... but I'll still use it for mp3's. I have to give it credit for showing me me everything I want (controls, playlist, lyrics) while only taking up about an 1/8th of my screen's real estate. I guess they made it look like iTunes so folks would feel comfortable? It does look a little iTunish, probably so they feel comfy, but it's open source with a bunch of great add-ons and it's definitely worth checking out. I swore by Winamp until my laptop fan died. Then winamp would heat up my laptop until it shutdown from overheating. iTunes, interestingly enough, did *not* cause this problem. I concluded that iTunes sacrificed memory usage at more efficient CPU usage, and I've been using it ever since. My beef with songbird? Not an easy thing to sync my iPhone or iPod with, which is the main reason I'm still using iTunes. I tried it over the holidays Mike but many of my songs didn't convert over. I didn't feel like investigating so it might be awhile before I try it out, if ever. I'm happy with iTunes, but I liked things about Songbird. it's probably one of the slickest skins/themes/Feathers for Songbird. I too tried Songbird earlier, but didn't feel it was ready. It seemed like it was on the right track though, with FLAC support. Now, I'm using it exclusively on both my Mac and Vista PC. I love the add-ons, and as lame as it seems, what sold me on it was the group of developers. I like people who put a face to a product and who actually seem to give a damn what people want. Apple is so bloody anonymous these days that I don't feel comfortable having iTunes as my primary player. I'm prepared to sacrifice iPod user-friendliness for now just to stay away from Apple in terms of my music life. Now, I'm using it exclusively on both my Mac and Vista PC. I love the add-ons, and as lame as it seems, what sold me on it was the group of developers.